TOM'S CLINICS ARE DESIGNED TO HELP BUILD A SOLID FOUNDATION BETWEEN HORSE AND RIDER, NO MATTER THE DISCIPLINE. HE TEACHES THE ADVANCED ART OF CONTROLLING YOUR HORSE'S FEET, "FROM THE GROUND TO THE SADDLE", ENABLING THE RIDER TO MOVE THE HORSE'S BODY WITHOUT DEVELOPING RESISTANCE OR BRACES. 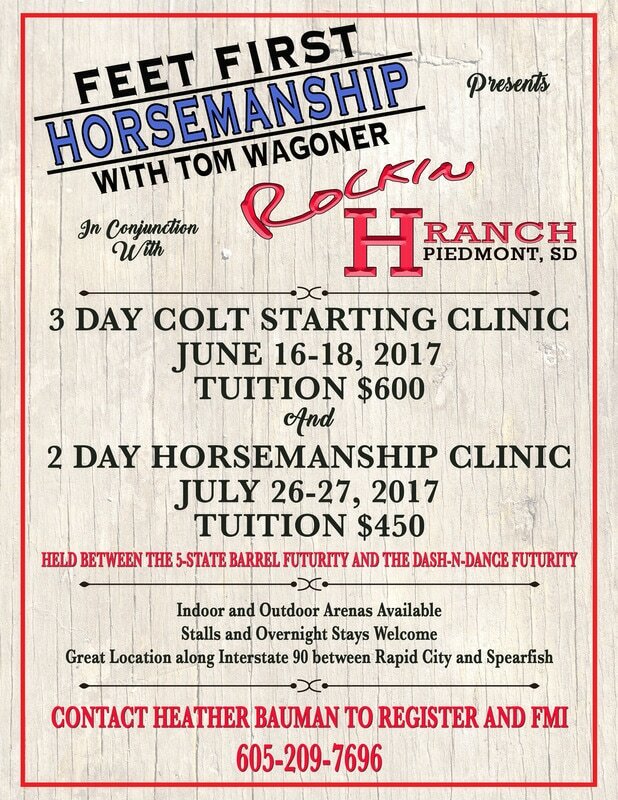 Tom offers two different clinic formats, Colt Starting and HOrsemanship. Colt Starting Clinics are 3-4 days, allowing enough time for proper ground work prior to riding. Horsemanship clinics are 2 days in length. CLINIC sizes ARE KEPT SMALL IN ORDER TO GIVE EACH PARTICIPANT INDIVIDUALIZED ATTENTION BASED ON THEIR NEEDS. Piedmont, SD...Rockin H Ranch is located along Interstate-90 between exits 46 and 48 in the beautiful Black Hills. This is a great location with both indoor and outdoor arenas and plenty of stalls to stay overnight. Call clinic host Heather Bauman to register, 605-209-7696. 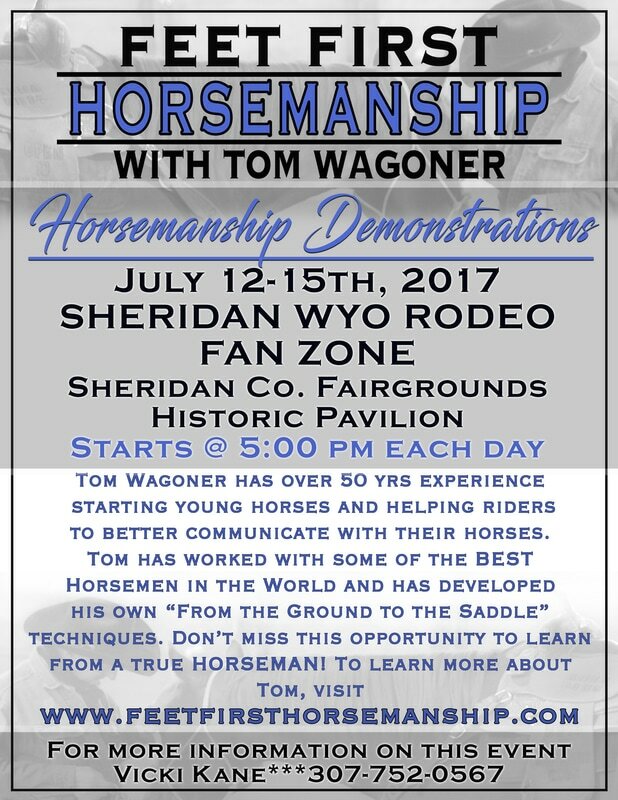 Free Horsemanship Demonstrations in Sheridan Wyo! Just show up and Learn! Thank you to Vicki Kane for organizing this event. Call Vicki for more info...307-752-0567. 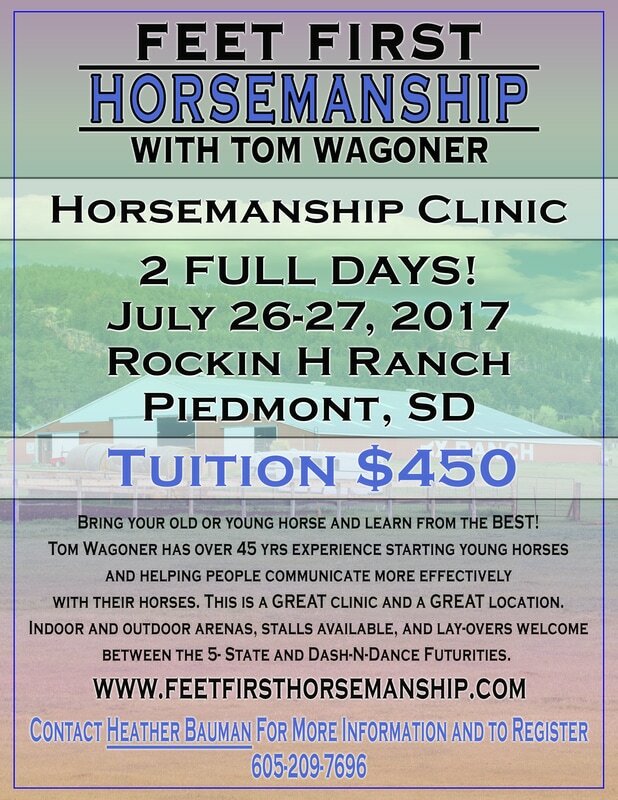 PIEDMONT, SD HORSEMANSHIP CLINIC!! Indoor and Outdoor arenas with plenty of stalls and overnight camping welcome. This clinic is scheduled between the 5-State and Dash-n-Dance Barrel Futurities. Piedmont is along Interstate 90 between Rapid City and Spearfish, SD. Don't miss it! Call Heather Bauman to register...605-209-7696. 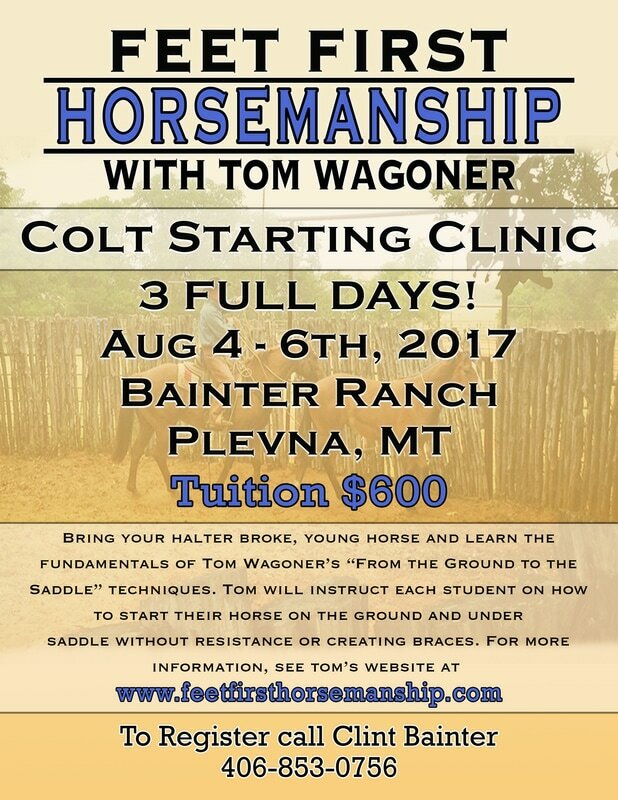 Plevna, Montana...COLT STARTING CLINIC. Not many colt starting clinics available anymore. ​Call host Clint Bainter for more information and to register, 406-853-0756.